'No End In Sight' For Arizona Fires; 389,000 Acres Scorched So Far : The Two-Way The blaze has now covered an area twice the size of the city of Chicago, and as the day began "zero percent" had been contained. Smoke from the fire has been detected as far away as Iowa. 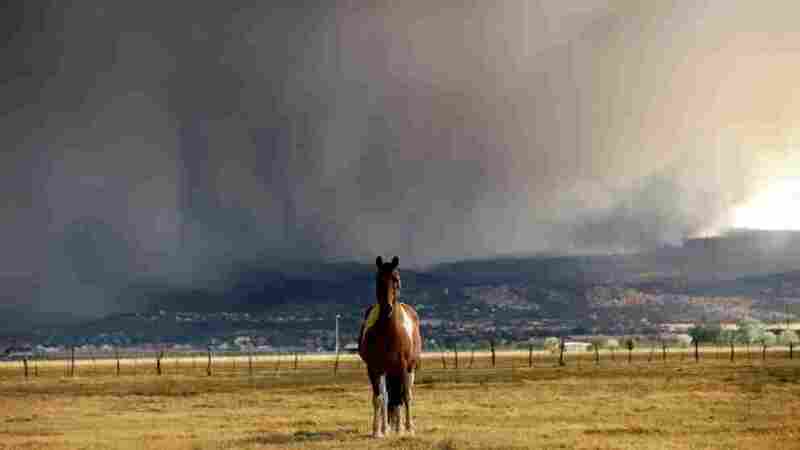 A horse stands in the middle of a field as the Wallow fire approaches in Springerville, Ariz., on Tuesday. The wildfire blazing in northeast Arizona is now the second-largest in state history and there's no end in sight, The Arizona Republic reports this morning. According to the Republic, the Wallow Fire is "growing by the hour, leapt farther north Tuesday and has now consumed about 389,000 acres." This satellite image from NASA's MODIS Land Rapid Response Team shows the fires in red, along the Arizona border with New Mexico (the line just to the right of the red marks that pinpoint the flames), and the smoke billowing to the northeast. It was taken Monday. Ominously, the newspaper adds that it is "at zero percent containment." Its headline says there is "no end in sight." The Associated Press says the fire "has burned 486 square miles of ponderosa pine forest, driven by wind gusts of more than 60 mph, since it was sparked May 29 by what authorities believe was an unattended campfire. [It is] now more than twice the size of Chicago." Crews are working to keep the fire from getting to the towns of Eagar and Springerville, Ariz. Smoke has been noticed as far east as Iowa and some air traffic to the area has been diverted to New Mexico in recent days. 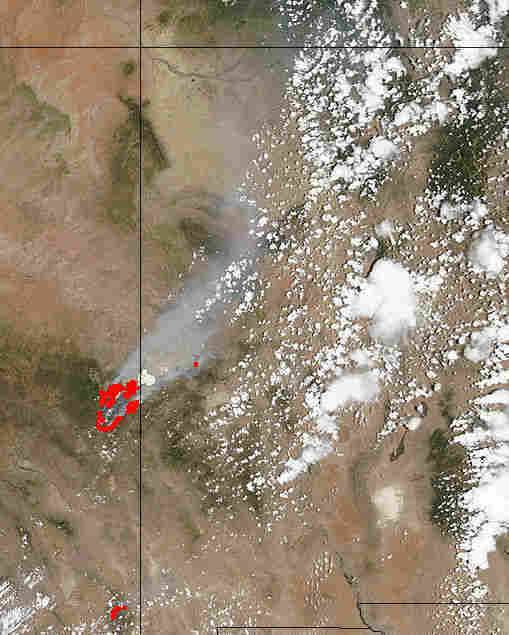 NASA, which notes that there is a second blaze known as the Horseshoe 2 Fire just to the south of the main inferno, has posted a satellite photo of the smoke spreading over neighboring states.